143 min. MGM Distribution Company. Director: Brian G. Hutton. Cast: Clint Eastwood, Telly Savalas, Don Rickles, Donald Sutherland, Carroll O'Connor. 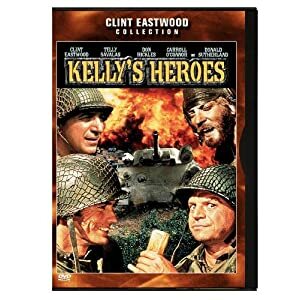 A strange but mostly satisfying hybrid of WWII actioner and anti-war satire, 1970's Kelly's Heroes echoes the action of director Brian G. Hutton's previous film—the 1968 When Eagles Dare—while embracing the counter-cultural comedy of M*A*S*H. What a difference two years made. Clint Eastwood plays the recently demoted Private Kelly, who gets wind (from a drunken P.O.W.) that a cache of $16 million in gold lies ripe for the taking in a French bank. The only problem: given the German occupation, that's about thirty miles into enemy territory. Still, nothing will deter Kelly, who's adamant that he will lay his hands on that gold, by hook or by crook. Recognizing he can't go it alone, Kelly confides in his Sergeant "Big Joe" (Telly Savalas), who initially wants no part of the scheme but finds himself dragged into it, and enthusiastic supply officer Sgt. "Crapgame" (Don Rickles), who practically licks his lips at the idea of what "could be the perfect crime." But keeping a lid on an unauthorized treasure-hunt mission proves impossible, with self-invited tank commander Sgt. "Oddball" (Donald Sutherland) the loose lips that threaten to sink the ship. "Oddball" is a decidely anachronistic presence as the leader of a tank outfit of pre-Beat, pre-"free love" hippies; they practice psychological warfare by playing music in battle and shooting paint out of their tanks. Pair these theatrics with the film's unofficial theme "Burning Bridges" (music by Lalo Schifrin; lyrics by Mike Curb of "The Mike Curb Congregation") and you get a very '60s WWII comedy. Hutton commands a strong ensemble, including Stuart Margolin, Gavin MacLeod, Harry Dean Stanton (credited as "Dean Stanton"), and Len Lesser (Seinfeld's "Uncle Leo"). Making an especially larger-than-life impression is Carroll O'Connor as Maj. Gen. Colt, a true-believing war monger who could have stepped out of Dr. Strangelove or the pages of Joseph Heller's Catch-22. And there's no underestimating the comic punch of Rickles, though he's underused in the picture's latter half. Kelly's Heroes is clearly a comedy, but its acid bite gives way to an an escapist last word that should probably be a bit more rueful (and come a bit sooner—at 143 minutes, Kelly's Heroes drags on a bit). The (anti-)heroes face plenty of wayward friendly fire before Colt comically mistakes them for actual heroes advancing the front into enemy territory, and a late scene lampoons Eastwood's spaghetti westerns, as our boys face off—on a war-torn French lane—with the Nazi enemy. Clearly, Hutton's the man for the job of the film's multiplicitous mayhem, heavy on the gigantic explosions. 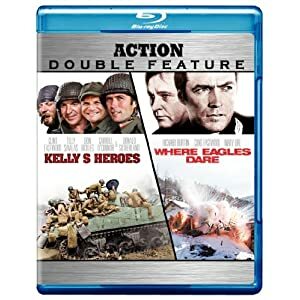 Warner continues its double-feature line with the "Action Double Feature" of Kelly's Heroes and Where Eagles Dare. Each film gets its own disc, maximizing disc space for the feature presentations. Kelly's Heroes looks good for its age, with any limitations (skin tones that skew a tad to the red, occasional softness) attributable not so much to the transfer as the source. Black level is surprisingly strong, and colors are generally rich. Like Where Eagles Dare, Kelly's Heroes gets a lossless DTS-HD Master Audio 5.1 mix, but the original audio doesn't much benefit from the high-def upgrade, which remains clear enough but front-heavy and not especially full. Of course, Where Eagles Dare (with its own extras) is the best "bonus feature" to Kelly's Heroes, but Warner has also included the "Theatrical Trailer" (2:49, SD) for Kelly's Heroes. All site content © 2000-2019 Peter Canavese. Page generated at 04/18/2019 12:03:13PM.